Superyacht CLOUD 9 is an elegant 196'10"ft CMN charter yacht built in 2009 by CMN Yachts. Interior and exterior styling by Andrew Winch Designs is bold and commanding. 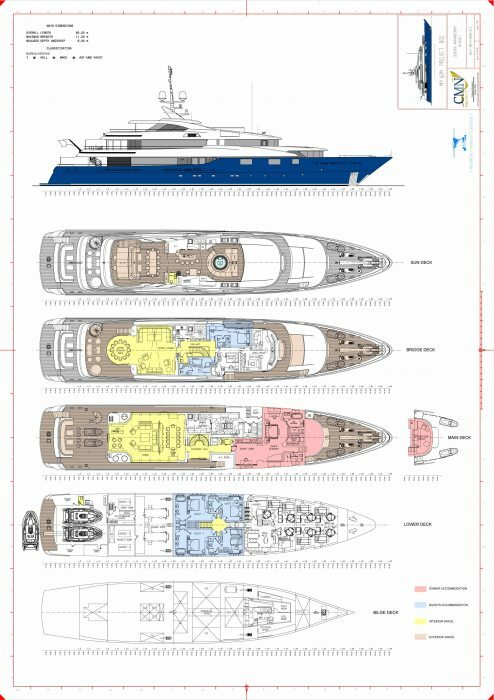 Deep blue hull, graceful lines and graduated tri-deck imbue the ship with a stunning nautical presence in any port of call. Sophisticated contemporary interiors are use an innovative layout based on curves rather than angles for a seamless and continual sense of flow. The master suite on board luxury charter yacht CLOUD 9 occupies the entire main deck forward comprising a sumptuous king size bed, an office, his and hers bathrooms, walk in closets and private observation lounge with stunning panoramic views. The lobby, master suite and observation lounge feature straight grain cherry, accents of dark brown and tan leathers and pale cream Alcantara overheads. Bathrooms feature pale Marron Imperial marble with dark Marron architraves. The VIP suite located on the bridge deck opens onto its own spectacular private balcony with two armchairs to admire the ever changing views!! Cherry interior with brown leather Venetian blinds and a bathroom in the same Pale Marron marble as found in the Master. The upper deck gymnasium is designed to convert into an extra cabin with two Pullmans, perfect for the extended family or staff. Equipped with cycle and running machines and featuring limed oak and cream fabrics with blue borders, this is a versatile and calm area with en suite shower room in the same marble and leather accents. On the lower deck are the four double cabins opening off a lower lobby with crew service discretely accessed via a mirrored "secret" door. Two forward guests cabins have double beds that convert into twins and each cabin has different color selections, plush furnishings and window treatments. Two aft cabins offer queen size beds. The main deck features a spacious and sophisticated entry with dramatic carved bulkhead finished in oxidised bronze providing a rich backdrop for a glass sculpture framed by the luminous spiral staircase. Dark brown Marron Imperial marble floor is complimented with a softer light Marron Imperial Clair marble matching the soft taupe coloured carpets that are found throughout the yacht. The staircase goes from lower to upper deck. Full beam formal living and dining area is divided by fixed screen bulkheads of rich woven leather framed in ripple plane veneered columns concealing sliding louvred privacy doors. Tall windows with low sills allow for dappled light through the Venetian blinds. The spacious aft decks have traditional large scale marine teak furnishings with off white and dark blue nautical upholstery to match the flag blue hull and white superstructure. Removable posts fit in sockets in the bulwarks to allow awnings to be attached to provide shade when required. External stairs provide full access to all decks for guests. The internal stairs also service guests on all decks. Crewed charter yacht CLOUD 9 has an exceptional crew that is adept at providing charter clients with the ultimate charter experience. This extraordinary yacht is an ideal choice for charter families charter and groups of friends due to the adaptability of accommodations. From event charters to race regattas to family reunions, Sunreef Yachts Charter offers a stunning selection of luxury megayachts to suit every charter requirement. Sunreef Yachts Charter features comprehensive information about extraordinary charter destinations worldwide. The Owner's cabin, with king size bed (207cm W x 206cm L)occupies the entire main deck forward comprising an office, his and hers bathrooms, walk in closets and a private forward facing panoramic lounge. The VIP, on the Bridge Deck, has a double bed (166cm W x 206cm L), en suite bathroom, walk in closet and its own private balcony, via sliding doors, with 2 armchairs to admire the ever-changing views! The Gymnasium is also on the Bridge Deck (to starboard) and is designed to convert into an extra cabin with two Pullmans (90cm W x 206cm L) and en suite shower. Exercise equipment includes cycle and running machine, cross trainer on deck, yoga mats and exercise ball. On the lower deck are the 4 double cabins opening off a lower lobby with crew service discretely accessed via a mirrored "secret" door. The two forward cabins have double beds that convert into twins (84cm W x 206cm L as singles or 164cm W x 206cm L). The aft two cabins offer the double beds and all cabins are en suite with bath and shower. Upper Saloon doubles as a cinema lounge and opens to the inside / outside dining area. The cinemas screen is HD and can play all movies on the Kaleidescape system or BluRay via disk. Screen dimensions - 3 meter diagonal. The main deck features a spacious entrance hall with dramatic carved bulkhead finished in oxidised bronze providing a rich backdrop for the exquisite Michael Newby glass sculpture made from 880 hand cut sheets of tempered glass. The formal living and dining area is divided by fixed screen bulkheads and the tall windows with low cills offer plenty of natural light.